This is a special post for Independence Day. 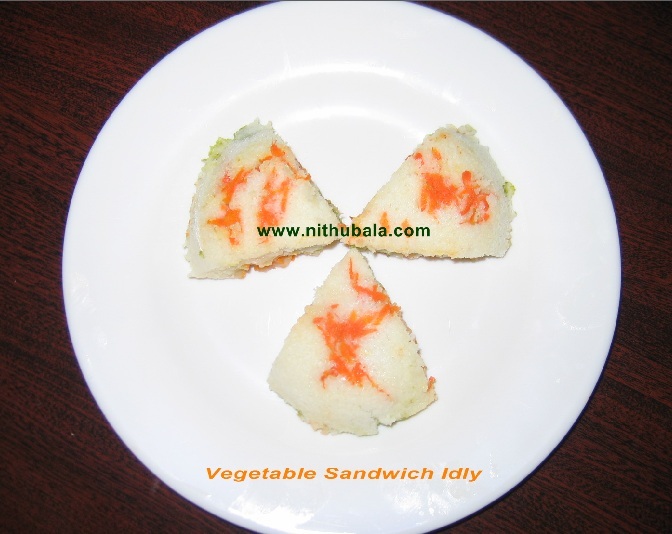 This Tri-Colour Idly is a healthy dish. This is best suitable for kids lunch box. You can serve the idly without any side dish. When you cut the idly, you can see the three distinct coloured layers. 1. Grease idly plate with gingelly oil. 2. Take a spoonful of grated carrot and spread over the greased idly plate. 3. Pour 1/2 tbs of batter over the carrot. 4. Take a spoonful of Mint & Coriander Chutney. Pour over the batter. 5. Now, cover the chutney with 1/2 tbs of batter. 6. Steam cook for 5 minutes or till the idly is cooked properly. 7. You can serve the idly without any sidedish. 8. If you wish, you can cut the idly and serve. This goes to my "Healthy Food for Healthy Kids - Kids Lunch Box", guest hosted by Latha. 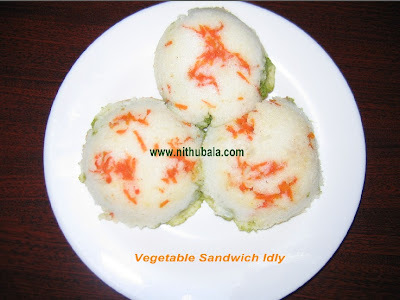 Amazing tri-coloured Idli. Happy Independence Day. Idlis look very delicious...thanks for the entry!